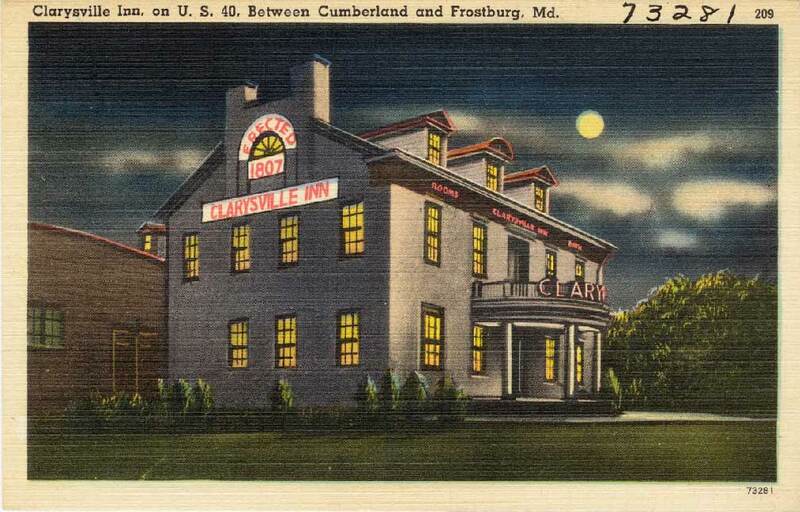 A postcard showing the Clarysville Inn ca. 1930-1940s. In the 1920s, an advertisement for the Inn boasted a room, bath, and chicken dinner all for $1.50. Clarysville Hospital was established on March 6, 1862 and was in operation until September 30, 1865. Located in Allegany County in western Maryland, the hospital developed out of the need for suitable accommodations for sick and wounded soldiers who were being treated in make shift facilities in nearby Cumberland. As early as June 1861, patient soldiers had been taken to Cumberland and were placed in hotels, warehouses, and engine houses. Both military and local physicians attended to their care. The area was not in the midst of any large battlefields but was located central enough to fighting that sick and wounded could be easily transported there after treatment at a field hospital. Cumberland was already known as a transportation center because it was situated along the National Road as well as the C&O canal. Despite the ease of travel to the area, unsanitary conditions, exhausted facilities, and insufficient supplies made proper medical care nearly impossible in Cumberland. The heat and humidity made conditions in the summer of 1861 even worse. By March 1862, about 1200 patients were lodged in Cumberland. According to a statement from Mrs. Mary Townsend, wife of local doctor Morris Townsend, it was she that suggested Clarysville as a potential site for hospital to military physician Dr. George B. Suckley, Surgeon in charge of the patients in Cumberland. Please note, at that time in the military, doctors were referred to as surgeons even when no surgery was performed. Dr. Townshend, a civilian doctor, was working under contract for the Army. Mrs. Townshend, while in town visiting her husband, suggested to Dr. Suckley that Clarysville located just eight miles away might be the perfect location for a hospital, describing it as a “delightful valley” with “the finest spring water, a large wagon tavern, several houses and three large barns not used for years.” Dr. Suckley examined the area and found it very suitable for a hospital. Renters agreed to leave the property and owners signed it over for use as a military hospital. A large inn at the site became the nucleus of the hospital and the other buildings on the property were quickly converted into wards. 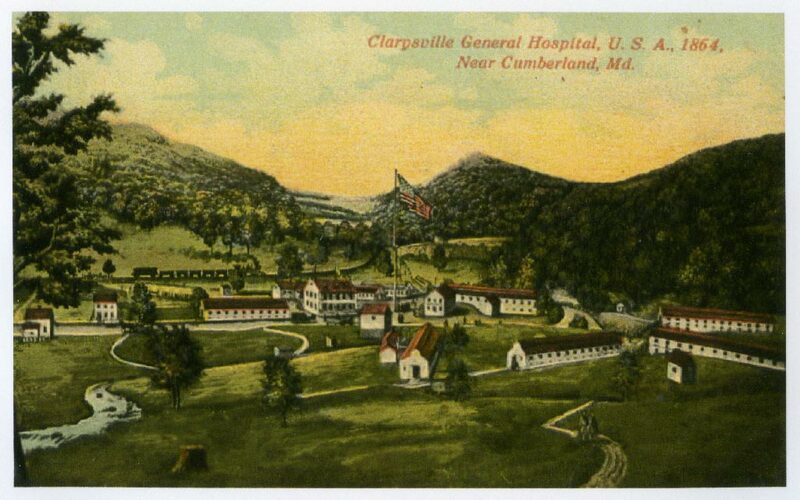 A picture postcard rendition of the Clarysville General Hospital near Cumberland, Maryland in 1864. Note the two story Clarysville Inn in the center of the image. Patients were moved from Cumberland to Clarysville on March 6, 1862. The following day, Assistant Surgeon Dr. William A. Hammond, under orders from General William Rosencrans to inspect the hospital at Cumberland, toured and reviewed the new set up at Clarysville. His report to the U.S. Sanitary Commission provides significant detail about the the facilities and the qualities that made the site ideal. He describes six original buildings that were already overfilled with patients. The parameter for the smallest allowable space per patient was 1200 cubic feet at that time. Fresh air and cleanliness were also conditions that were considered necessary for convalescence. Dr. Hammond describes Clarysville as being at a high elevation which brought cooler temperatures. The location also had an abundance of fresh water. He described the nurses and orderlies as inexperienced and the ward master uneducated, but energetic. The apothecary was intelligent; the cooking tolerable with good bread. Proper diets for patients were not adhered to and bedding was deficient. For the second day of operation, it was not a bad report. His report on the conditions in Cumberland had no positives. Dr. Hammond, who became U.S. Surgeon General just a month later, was “revolted and shocked” at the “deplorable” conditions there. Acting Assistant Surgeon S. B. 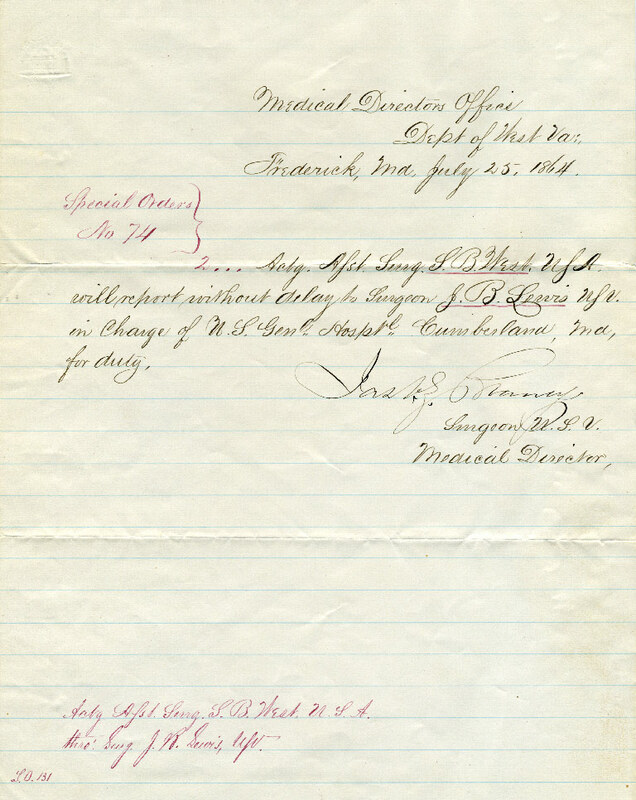 West was appointed to the Clarysville U.S. General Hosptial on July 25, 1864. Dr. West could have been a civilian doctor who worked under contract rather than being a physician enlisted in the military. Dr. West’s practice was established in Belmont, Ohio. He was born in 1812 and died in 1885. Some patients continued to be treated in facilities in Cumberland, but the hospital at Clarysville became the main location for treating sick and wounded soldiers in the area for the duration of the war. Over time, 23 more buildings would be added to the facility including ridge ventilated wards, an innovation introduced by Dr. Hammond during his stint as Surgeon General. These long buildings had many windows and ventilators in the roof ridge that drew air into the wards. Interestingly, the first of these ridge ventilated wards was constructed at the Army hospital in Parkersburg, West Virginia. The Clarysville Inn was the center of the facility. It was constructed by Gerard Clary and served as a stage coach stop on the National Pike. After Gerard’s death in 1850, it passed on to his nephew Aden Clary. Only one contemporary image of the hospital in its full capacity exists, a lithograph that shows all the buildings. That image adorned picture postcards in a later era. In August of 1862, the Clarysville hospital and the Cumberland facilities were consolidated for official purposes. The sites were called the “United States General Hospital.” References to the U.S. General Hospital could mean either location, but the majority of patients were at Clarysville. The hospital served 1000 to 2000 patients at any given time during its existence. A number of total number of patients treated during the War is elusive, but the facility remained at capacity at all times. Military physicians served as Surgeons in charge of the hospital. The first was Dr. Suckley, who was followed by Dr. George Oliver. Dr. Oliver spent one year in charge of Clarysville Hospital. Although patient care did not seem to be affected, several calls for Dr. Oliver’s removal marred his tenure. He was reportedly an alcoholic and was eventually reassigned. After Oliver’s departure, Dr. John B. Lewis took charge. It was under his tenure, that Dr. S. B. West (sometimes referred to as Samuel, other times Simon) worked at Clarysville. Bed cards, medical descriptive lists, and correspondence to and from Dr. West make up the Clarysville Hospital Collection at the West Virginia & Regional History Collection. Little information is known about the nurses and orderlies that staffed the hospital, but is in known that recovering soldiers assisted in many Civil War hospitals. A list of matrons attached to the Clarysville hospital (matrons were women who supervised wards) does exist and shows 34 women who worked there between the years 1863-1865. Locals from Alleghany County supported the hospital and patients in a number of ways. Women brought food and homemade candies for the soldiers. A nearby creek was dammed to create a place for wading and swimming. Patients were brought from the hospital to the impoundment to aid in their recuperation. Typical battle wounds and infectious diseases afflicted the patients at Clarysville. Diarrhea and dysentery were constant problem. Contagious diseases such as typhoid fever, malaria and measles were also present. Pneumonia, pleurisy, rheumatism, jaundice, syphilis and hepatitis are among a long list of conditions treated at Clarysville. Surgeries were performed there as well. One register book lists 119 surgeries during a two year period. It is important to note that the overwhelming majority of patients at Clarysville were Union soldiers. But Confederates were also treated there. Patients who died at the hospital were buried in cemeteries near the facility. Union dead were disinterred and reburied at Antietam in 1867. Confederates were moved to cemeteries in Cumberland in 1900. Two months after the end of the Civil War, the designation of the Clarysville and Cumberland hospitals was changed from a General Hospital to a Post Hospital. Post Hospitals were more temporary and generally served an encamped regiment. This downgrade and the end of the influx of patients was the beginning of the end of the Clarysville facilities. Over time all of the buildings were vacated and sold. The Inn went back to the original owners and became a popular hotel and night spot in the early twentieth century. During the centennial anniversary of the end of the Civil War it was marked with a plaque to commemorate the hospital. Sadly, the inn was destroyed in a fire in 1998. None of the other buildings are in existence. In modern times, Interstate Highway 68 runs parallel to the old National Road in this area. A historical marker near the original location now tells the story of the Clarysville Hospital. For more information, see Harold L. Scott, Sr.’s 1995 book, The Civil War Hospitals at Cumberland & Clarysville.